Last week, the United Nations released a sobering report on global climate change, warning that the continuing buildup of greenhouse gases poses "severe, pervasive and irreversible impacts for people and ecosystems." I considered this as I visited the site of one of the Bay Area’s last coal mines that has been closed since 1906. Black Diamond Mines Regional Preserve features a landscape of steep sandstone hills, chaparral and grassland, with remnants of old coal and sandstone mines pocketing its surface, though all known entrances are sealed or monitored. Coal was the fuel that powered the Industrial Revolution. Formed from plants primarily in swamps and bogs, where the plants die and then are altered into coal in the pressurized environment beneath the Earth’s surface. 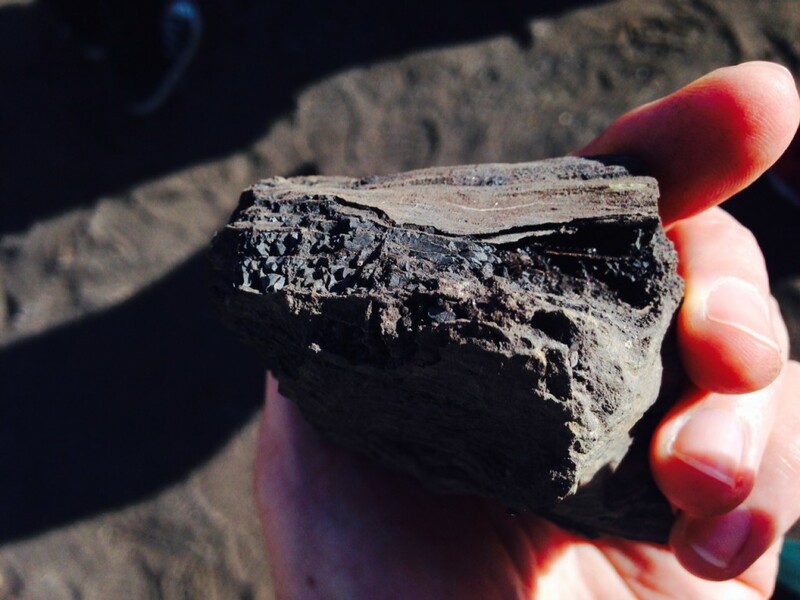 In the tour of Black Diamond, we found petrified wood with coal pockets on some of its surfaces, caught partway through the transformation process. The coal fields around Mount Diablo were discovered in 1855. During its heyday, the area had 12 mines that supported thousands of miners and their families from around the world in five town sites. Four million tons of sub-bituminous and lignite coal was extracted from the Mount Diablo coal fields until the quantity, price and quality was overtaken by a larger operation with higher-quality anthracite coal from Washington State. The townsites were abandoned and houses moved when the mines closed around 1906. The only remnants are the old cemetery on the hillside, non-native trees brought by the miners and grey piles of mine tailings. There were other coal mines in California around the same time, in Tesla near Livermore, and in Ione (Amador County). Worldwide, coal accounts for a growing percentage of global energy needs, about 30%, especially in developing countries. The United States ranks number two behind China in coal usage, primarily for electricity production. In comparison to the rest of the U.S., California has only about ten coal production plants, which accounts for less than 1% of the states energy usage. Strict regulations for air quality standards and more plentiful natural gas, hydro power and alternative sources help to meet California’s energy needs. You can visit Black Diamond Mines through November to get an underground mine tour, otherwise you'll have to wait until February when the tours resume for the season. More information about the weekend public tours is available on the East Bay Regional Parks website. The guided tour takes you through the workings of a sandstone mine that operated from 1920-45. 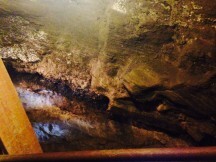 The coal mines, collapsed when they were abandoned, can be seen underground where they intersect with the newer sandstone mine. Within the park, visitors can also explore the Prospect Tunnel for 200 feet on their own – bring a flashlight. Though California is one of the most energy efficient states –- 40% less electricity use than the average American according to Sourcewatch -- you can also consider what else you can do to help reduce greenhouse gas emissions and help halt climate change. Check the Environmental Protection Agency's website to find additional actions you can take to help the planet and ourselves.